EXCLUSIVE! Cooking tips at your fingertips. 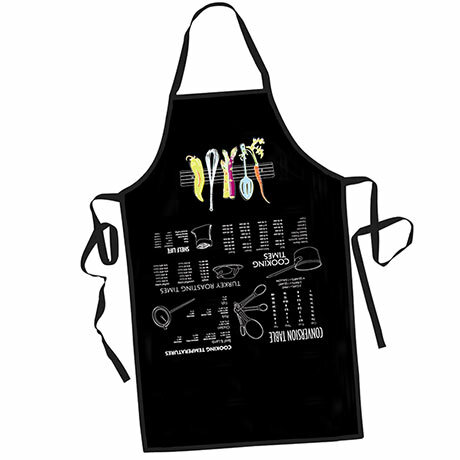 Lift the edge of this apron to find basic facts fast: a conversion table, cooking temperatures for meats and fish, turkey roasting times, cooking times for various veggies (boiled, microwaved, steamed, or roasted), and a shelf-life chart for common pantry items. No need to stop cooking and page through a book. Black apron is 65/35 cotton/poly blend, one size. 23" long. Imported.